See these moving parts inside the hard drive? They can stop working in a second. The little arm that looks like an old-fashioned turntable tone arm can get stuck to the side. The platters can stop spinning. The circuitry can chip or age and short out. So please backup your hard drives. It can be traumatic for clients to lose all their photos, files, business contacts; it’s really stressful for us when we try to retrieve them from a defunct hard drive knowing what the client could lose. Be easy on yourself and us at Ducktoes and make backing up an everyday or every week thing. Then we can all breath a sigh of relief. We hate to tell people their hard drives are toast or deader than a doornail and they’ve lost everything. Or that they have to mail their hard drive to to a clean room and spend $1200 or more and, even if they are willing, that doesn’t always work. Go right this second and attach your external hard drive and back up your computer. Thank you. Or make it part of your every year computer maintenance and repair check up and bring it in to Ducktoes. We can automate the process for you. I can’t say this often enough. Hard drives are vulnerable and flimsy. They are the most common piece of hardware to go bad, so you, a computer owner, are under constant threat of losing your data. So never, ever, go without backing up your data. You can not rely on your hard drive! Just because it is here and working today, doesn’t mean it will be there and working tomorrow. You need to be proactive and make sure you have your valuable data backed up…do not put this off. I say this because every week I order hard drives, many hard drives, from my wholesalers, to put into people’s laptops and desktops. Their original hard drives have gone bad. 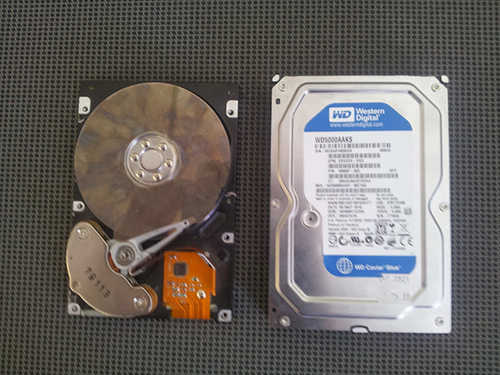 A few hard drives stop spinning, are as dead as a doornail, a paperweight, an inert mass of machinery. These we can not any retrieve data from, even with our most expensive data recovery software. They are toast. They have to sent to a clean room to have the data rescued. This costs beaucoup bucks. What are the most common types of hard drives to go bad? In my experience, judging only from what I buy every week: notebook or laptop hard drives. I buy many every week. They are so skinny and so vulnerable to mishap, to being dropped, overheated, overfilled, and bumped. They fry. They click. They make weird grinding noises. They stop dead. Notebook drives are the flimsiest, but desktop hard drives also go bad on a regular basis. What can you do? You can back up your data on a regular basis. Then you’ll only lose what you’ve changed or added since the last backup. This will prevent data loss. To prevent loss of programs, you should keep the cd or dvd disks of the software you buy and their key codes to prove you’ve bought them. If you’ve downloaded them online, you can print out the email you received upon purchase and put it somewhere you can find it. You can make an image of your hard drive which contains all data and programs just as they are on the day you make the image. Or have your tech shop make an image for you and put in on an external drive for you. If you don’t know how to backup your hard drive, then learn from a techy friend, or hire a tech to do it for you or show you how. Take responsibility for your data, make sure you have it for the future. If you do not keep your key codes and disks to the programs you own, it is unreasonable to expect your tech or tech repair shop to reinstall them when you need a new hard drive. We do not have copies to all the software you own. There are thousands, maybe millions, of different kinds of software. They may well-known to you in your field or leisure activity, whether it’s real estate or law or photography or the newest gaming software, but we are not in your field or leisure activity and not privy to your software. We usually can figure out any software if you need help running it. But as for installing it, even if we do have the disks, we can not install them without their key codes. The software itself will not allow it usually or there is a trial period after which the software stops working. Some clients do not understand when we can’t install their software, they think we have more ability than we do to override keycodes, or have hidden software up our sleeves, are magical. We aren’t. We can’t. We can not outsmart Microsoft and even if we could, it would be unwise, if not illegal. They are ways of downloading software without paying for it, but don’t ask us to do it. It takes a lot of time and is illegal. If you pay someone to download illegal software for you, you might as well buy the software legally. So back up, back up now and on a regular basis.